One year ago, WhatsApp was launching a new app dedicated to small business owners, called WhatsApp Business. In the meantime, they have reached more than 5 billion businesses customers all over the world. The results of using the business app were, for some businesses, increases in over 30% of sales. What are the new Functionalities for WhatsApp Business? There are two new functionalities that will be available on desktop, on the web app, that have worked on the mobile app only until now. Let’s see which are those! Following the model that Facebook has with the quick replies, which allow businesses to choose predefined answers to the most common questions asked. In order to do this action, you must press the / symbol on your keyboard and select the answer you want to share. This functionality comes right in hand with the other predefined ones, such as the greeting messages or the away ones, that lets your customers know you’ll be answering when you are back online. The labels will let you filter your contacts and chats with certain labels in order to be able to find them easily whenever you need a piece of information. The chat list filtering feature allows you to filter your chat messages under labels such as unread messages, groups or broadcast lists. All those new features that were introduced on the web app help business owners that mostly work on a laptop or computer to easily communicate with their customers. From now on, they won’t have to choose two different devices to help their businesses grow with the help of WhatsApp business. Do you use WhatsApp Business to keep in touch with your customers? 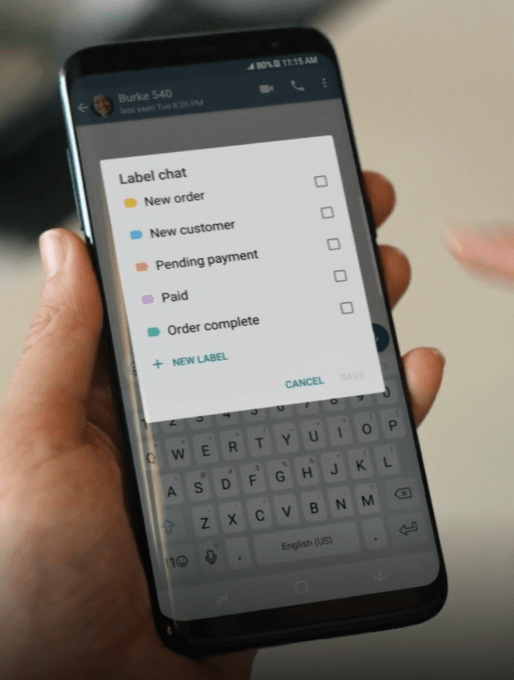 Do you think those new features will be indeed good for business owners and will encourage more of them to use WhatsApp to grow their businesses? Let us know in the comment section below! See also: Why Instagram Will Never Be the Same starting today?